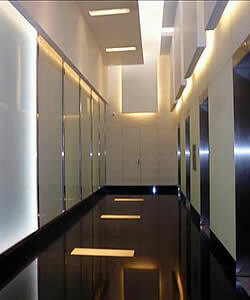 The commercial elevator in today’s modern building has seen a change in the recent years. The introduction of new technology and destination-dispatch systems have seen success in many commercial buildings. The destination-dispatch systems require the passenger to request the floor on a dashboard followed by the correct elevator to board. The ride proceeds with little to no stops. This system is being incorporated into more mid-rise and high-rise commercial buildings to improve traffic patterns and flow. Many well-known buildings use high-speed modern elevators. The Empire State Building uses Otis high-speed elevators, which the staff control the elevators. Visitors do not have to push any buttons. The model used is the Hitachi Ultra-high speed elevator that moves 1200meters per minute. The Shanghai Tower in China, the world’s second tallest building, recently upgraded to high-speed elevators. The high-speed elevators are considered faster than Usain Bolt is. The fastest operational elevator made by Toshiba, travelling at a maximum speed of 1,010 meters per minute, is in Taiwan’s Taipei 101 skyscraper. This elevator moves at four floors or 41 vertical feet per second. The Equitable Life Assurance Building (180 Foot Tall) is the first office building with an elevator and the world’s first skyscraper completed in 1870 at 120 Broadway. The original World Trade Center’s Twin Towers introduce the first express elevators because they were so tall. These elevators moved at a speed of 1,600 feet per minute travelling to “sky lobbies” on floors 44 and 78. From those floors, local elevators were available to other floors. Express elevator were also available to the top floors of each tower. 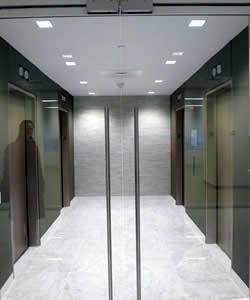 The introduction of aluminum and carbon fiber elevator cabs reduced the wind resistance to increase speed. Due to the high speed and heights of the buildings themselves, air pressure control systems are installed to avoid any pain to the ears. Brakes are an important component to the high-speed elevator. The brake system on a high-speed elevator is similar to any elevator system except with stronger more robust components. Elevator speed is determined by the strength and weight of the support cables. The longer the cables, the heavier they tend to be, and to compensate a more powerful motor is needed. Acceleration and deceleration are computer modified to reduce vibration in the elevator cabs. To cut down on lateral movement due to the bend in the laser-calibrated rail, oil-filled dampers are connected to a roller guide acting as the elevator cab’s suspension. As more skyscrapers become more prevalent, high-speed elevators are in demand more than ever. Many buildings throughout New York City, both mid-rise and high-rise, feature high-speed elevators to better serve visitors and employees. We have data on all the buildings throughout Manhattan fitting the specific details you are looking for. Contact us and we can assist you on this search with no obligation and no fee.